Are you feeling like you are running out of energy? Tired and weak? If so, you may not be getting enough iron. I am loving this chickpea salad with so many flavors and health benefits. This salad was inspired by a trip to Canada I took this past weekend. Chickpeas have many health benefits, and one big vitamin you can get out of chickpeas is the high source of iron. Iron is important for making enough healthy oxygen-carrying red blood cells. Without the healthy blood cells, the body can't get enough oxygen. Other than the benefits of iron, the cucumbers will help fight cellulite. 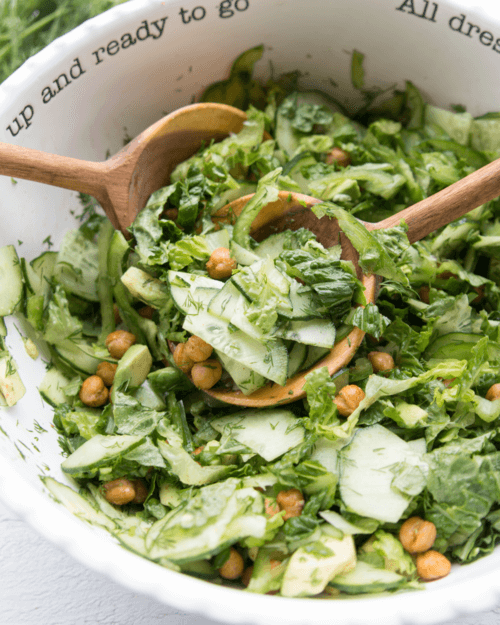 This salad is filled with green veggies that will benefit your overall health and keep you feeling great! Mix together chickpeas, 1/4 t. paprika, 1/4 t. cumin, a pinch of salt, and 1 teaspoon olive oil. Spread out on a baking sheet and roast for 15 minutes. 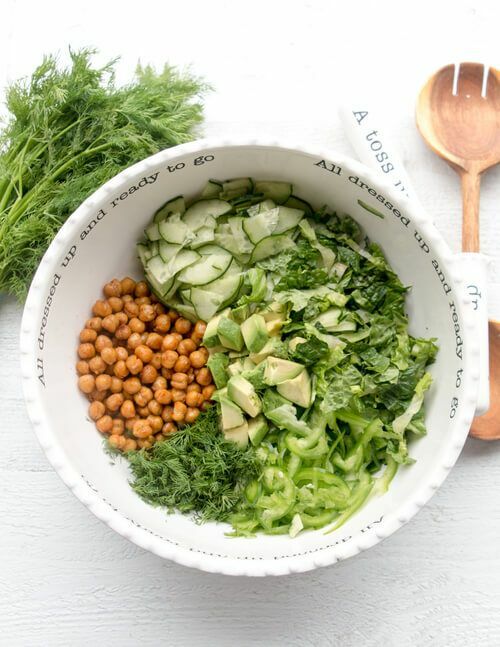 Combine romaine, bell pepper, avocado, dill, cucumber, and roasted chickpeas together. Toss salad with 1 Tablespoon olive oil, salt and pepper to taste. Enjoy. Mix together chickpeas, 1/4 t. paprika, 1/4 t. cumin, a pinch of salt, and 1 teaspoon olive oil. Spread out on a baking sheet and roast for 15 minutes.